There are currently an average of 8 trucks in service daily, five trucks been ordered and are expected to arrive in November, overtime expenses for waste collection to date of $26,227.25 is “dramatically less than the $250,000 spent last year on overtime in this quarter,” and once a week garbage collection will continue until at least year end. This was from Minister of Public Works Lt/Col David Burch who provided an update on waste collection in the House of Assembly today. “Since my last report on April 17th there has been an ever increasing acceptance of the new once a week garbage collection – so let me again thank the people of Bermuda, who have generally transitioned smoothly to the change in schedule,” the Minister said. “I am also pleased to report that the Waste Management staff are adequately coping with the new schedule even with a limited number of available vehicles. With on average 8 trucks in service daily – we are able to cope with current staffing levels and as such we will not be hiring additional staff at this time. “We are still experiencing some challenges with truck maintenance as the number of trucks in the fleet are still well below optimum. “Five trucks have now been ordered and are expected to arrive on island in late November. I must caution though that even with the purchase of five new trucks we will still not be at a full complement of vehicles as many of the trucks currently in the fleet have surpassed their life expectancy. “Over the course of the once a week collection period – I can report that we have seen a levelling off in the amount of household waste collected when compared to last year’s twice a week figures. You will readily see from the attached chart that virtually the same amount of household waste is being collected this year versus last. “We have seen a steady increase in those using the public drop off since the extension of operating hours on Saturdays. I have asked the plant manager to explore with the operator the feasibility of further extending the hours to make it even more convenient to members of the public desirous of utilizing this facility. “One of the significant benefits of this new scheduling is the reliability factor and consistent collection of waste on the day scheduled. Likewise the overtime expenses for waste collection to date of $26,227.25 has almost exclusively been a result of collection following public holidays and is dramatically less than the $250,000 spent last year on overtime in this quarter. “We have not just saved money as a result of this new scheduling – there have been savings in fuel, wear & tear on vehicles, illness and injuries. Not surprisingly – staff morale has improved as well – as these workers – who take great pride in their work are pleased that they can actually deliver on what has been promised. “I will be announcing shortly the plan for the reintroduction of bulk waste pick up in some form to assist the community. It will most likely be on a request basis rather than scheduled so that we can better manage funding for this unbudgeted expense. “So with that back ground and all the positive outcomes noted above – the reality is we cannot contemplate a return to twice a week collection anytime soon with the limited vehicles available – so once a week garbage collection will continue until at least year end. I rise to report on the current status of garbage collection – since my last report on April 17th there has been an ever increasing acceptance of the new once a week garbage collection – so let me again thank the people of Bermuda, who have generally transitioned smoothly to the change in schedule. Mr. Speaker, I am also pleased to report that the Waste Management staff are adequately coping with the new schedule even with a limited number of available vehicles. With on average 8 trucks in service daily – we are able to cope with current staffing levels and as such we will not be hiring additional staff at this time. We are still experiencing some challenges with truck maintenance as the number of trucks in the fleet are still well below optimum. Mr. Speaker, you will recall that a team travelled to the UK in April to inspect and test the new trucks we were looking to purchase. 5 trucks have now been ordered and are expected to arrive on island in late November. I must caution though that even with the purchase of 5 new trucks we will still not be at a full complement of vehicles as many of the trucks currently in the fleet have surpassed their life expectancy. 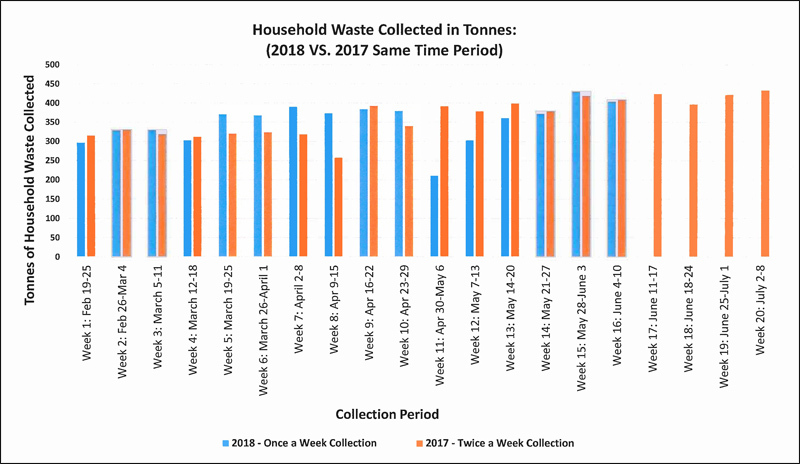 Over the course of the once a week collection period – I can report that we have seen a levelling off in the amount of household waste collected when compared to last year’s twice a week figures. You will readily see from the attached chart that virtually the same amount of household waste is being collected this year versus last. Concurrently, Mr. Speaker, we have seen a steady increase in those using the public drop off since the extension of operating hours on Saturdays. I have asked the plant manager to explore with the operator the feasibility of further extending the hours to make it even more convenient to members of the public desirous of utilizing this facility. One of the significant benefits of this new scheduling is the reliability factor and consistent collection of waste on the day scheduled. Likewise the overtime expenses for waste collection to date of $26,227.25 has almost exclusively been a result of collection following public holidays and is dramatically less than the $250,000 spent last year on overtime in this quarter. And of course Mr. Speaker, we have not just saved money as a result of this new scheduling – there have been savings in fuel, wear & tear on vehicles, illness and injuries. Not surprisingly – staff morale has improved as well – as these workers – who take great pride in their work are pleased that they can actually deliver on what has been promised. They have been actively engaged in assessing the progress over the period with recommendations covering the entire operation but most notably in the challenges with the pickup zones. As we approach the summer months we increase the amount of garbage we produce with a peak over the Cup Match weekend. Collection for those two days will occur on Saturday August 4th. Since the coverage areas are reduced we anticipate being able to comfortably manage collection on that day. Mr. Speaker, I will be announcing shortly the plan for the reintroduction of bulk waste pick up in some form to assist the community. It will most likely be on a request basis rather than scheduled so that we can better manage funding for this unbudgeted expense. So with that back ground and all the positive outcomes noted above – the reality is we cannot contemplate a return to twice a week collection anytime soon with the limited vehicles available – so once a week garbage collection will continue until at least year end. Long before we reach that point however, Mr. Speaker, we will have concluded all the back ground work and alternative Options necessary to make a firm recommendation to Cabinet on the way forward to be followed shortly thereafter with a public announcement. Immediately though there will be some minor adjustments to the collection schedule for some areas to minimize the need for overtime work in of those zones. Monday collection the easternmost boundary will move from Church Road to Waterlot on Middle Road to Sinky Bay on South Shore Road. Tuesday collection from Cobbs Hill to Chapel Road, 5 Hill to Southcote Road. Wednesday from Trimingham Hill to Tee Street. Thursday from Tee Street to Devils’ Hole. The Friday collection zone remains the same. Mr. Speaker, those adjustments will become effective after the Cup Match holiday on Monday August 6th – a map of the new boundaries will be published along with an extensive media campaign to advise of the changes. Additionally, in response to several requests from members of the public to extend the opening hours of the public drop off on Sundays – we have agreed the adjustment with the service provider – those changes will also become effective on August 6th. Mr. Speaker, I wish to assure the members of this House and the public that we will continue to assess this situation, take the necessary steps to address any unforeseen challenges and efficiently address the management of our waste going forward. All of us can help in that regard by reducing the incredible amount of waste we generate, recycling and composting food waste. We are experiencing an increase in maggots in the waste – this is mainly due to a combination of food waste and the climate which are the perfect conditions for them to flourish in. Some members of the public have suggested lidded trash bins to freezing food waste until the day of collection. I know that our Education Officer would wish that I recommend to you that you also consider composting which is a painless way of helping the environment as well as successfully disposing of food waste without running the risk of attracting feral chickens, cats or vermin to your trash. 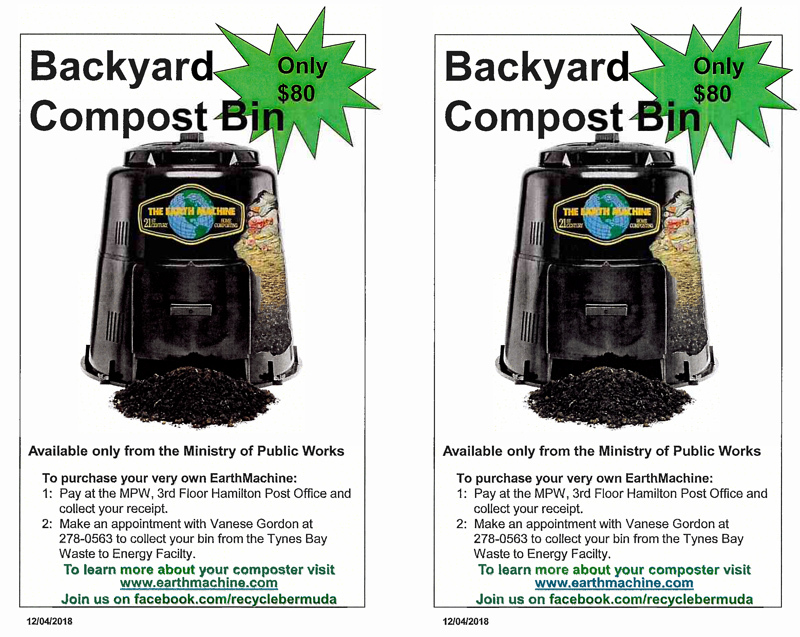 Of course it is made considerably easier if you purchase a composting bin from any of the local hardware stores or the best type can be purchased from the Ministry of Public Works and l have taken the liberty of attaching a flyer to this statement.